You can enable Email forwarder with one click “Enable Email Forwarding”, it will automatically add required MX records to your Domain DNS. Note: If you’re using Register.ly DNS Management Service for your domain, you can click [Enable Email Forwardign] button to automatically update domain MX records. Source Address: Enter the email address you want to create. Destination Address: Enter the email addresses where you would like to receive the forwarded email. How do I update whois information for my domain? How I can cancel an invoice for a domain I don't wish to renew? 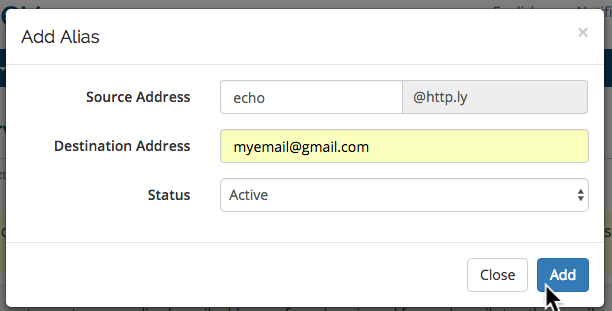 How can I setup my .ly domain for GoogleApps? How can I update my DNS nameservers? When will a .LY domain become available? How do I set up a "catch-all" email account? Can I have changes made to my MX Record?